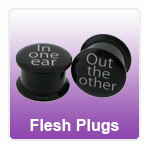 A great range of colourful acrylic Icon flesh plugs to show off your stretched ears with. One of the most popular pieces of body piercing jewellery sold today. New styles of Ear stretching plugs are being added all of the time so be sure to check back for our latest stretching designs.